Turkey's military operation against the People's Protection Units (YPG), a U.S.-backed Syrian Kurdish militia, has entered its third day with reports of growing civilian casualties. Turkish soldiers backed by tanks are moving deeper into the Syrian enclave of Afrin in an effort to oust the militia. Turkey claims to have captured several villages. The YPG counters it has recaptured two of them amid reports of heavy fighting. 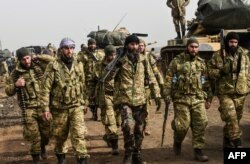 On Sunday, thousands of fighters of the Free Syrian Army, many trained by Turkey, opened another front against the YPG, which Ankara accuses of supporting a decades-long Kurdish insurgency in Turkey. The YPG is a key ally of Washington in the war against Islamic State militants. And diplomatic pressure is growing on Ankara over the operation, with Washington calling for restraint. But on Monday, Turkish president Recep Tayyip Erdogan dismissed calls for an early end to the offensive. "How dare you ask us? We will stay as long as we need," he said "We have no interest in staying there. We know when we will leave." He went on to point out how long U.S. forces have been fighting in Iraq and Afghanistan. Erdogan's strong pushback comes as NATO Deputy Secretary General Rose Gottemoeller visited Turkey for talks. France has called an emergency meeting of the U.N. Security Council to discuss the operation. Turkish Foreign Minister Mevlut Cavusoglu issued a warning Sunday to members of the Security Council, saying "if France or any other country takes the issue to the United Nations, then we will consider it as siding with a terrorist group, not with an ally. And we will treat it accordingly." But with local human rights groups claiming that a growing number of civilians, including children, are being killed by Turkish bombing and artillery, international demands for restraint and a quick end to the operation are expected to grow. More than a million people are believed to live in the enclave — many of them refugees from the Syrian civil war. Ankara insists it is making all efforts to avoid civilian deaths. And Cavusolgu dismissed reports of civilians casualties as terrorist propaganda. Reports say Turkish authorities have arrested 30 people on terror charges for posting social media messages opposing the operation. A series of anti-war protests across Turkey have been broken up by police with many arrests. On Sunday, Erdogan warned protests and opposition to the operation would be crushed.